Bottomless brunches (and other drink specials) to help you recover… or keep the party going. Let’s face it: It’s the last day of the year, you’re going to go out with a bang. And you deserve it, what with having to soldier on after “Breaking Bad” and survive the Summer of Sharknado, 2013 was tough. So do yourself a favor and plan ahead, making reservations now for that New Year’s Day hangover brunch. Lucky for you there are plenty of options all over L.A., whether you’re looking for bottomless booze or that specialty cocktail packed with vitamins. Bonus is that most also offer stomach-comforting brunch dishes. Happy New Year, my friends, and happy drinking! ✶ Chef Susan Feniger’s newly opened Mud Hen Tavern will be kicking off its new brunch menu on New Year’s Day starting things off with a special hangover edition from 11 a.m. to 2:30 p.m. For $25 famished guests can enjoy unlimited brunchy small plates of Hangover Burgers, Kaya Toast, and Chilaquiles while washing that all down with $15 bottomless sparkling cocktails. ✶ Stella Barra will cater to those who can’t be bothered to change out of their jammies or onesies. Show up in your night clothes and score a gift certificate equivalent to the price of your meal. Enjoy a green eggs and ham breakfast sandwich with $5 bottomless mimosas and Bloodys at the Santa Monica location and Cinnamon Crunch Pain Perdu with $10 bottomless in Hollywood. ✶ Fig Santa Monica swears to have just the thing for your post-party aches: the “Hangover Cure Cocktail.” Made with tomatillo water, avocado, green tabasco, and tequila, they say it’s chockful of vitamins and antioxidants to reinvigorate you. Start off with that as an aperitif, then jump into the Fig’s $35 bottomless “Kegs and Eggs”: any brunch item (hellooo, Chef Ray Garcia’s Huevos Rancheros with roasted poblanos) and an endless pint of draft beer. ✶ At the Beverly Wilshire’s The BLVD, sink into its fancy brunch of “Fluffy Pillows” pancakes with mixed berries and powdered sugar or the “Blvd Benedict” of lobster, Parma ham, Swiss chard, grilled country bread, and hollandaise. For $30, you’ll have access to the Bloody Mary bar for bottomless imbibing, playing with the different housemade mixes and garnishes. At 1 to 8 p.m. it’s “Sip & Shuck” time at the champagne bar where you can indulge in a dozen oysters and two glasses of Perrier Jouet “Grand Brut” for $75. ✶ For poolside recovery, there’s The Backyard at W Hotel in Westwood. 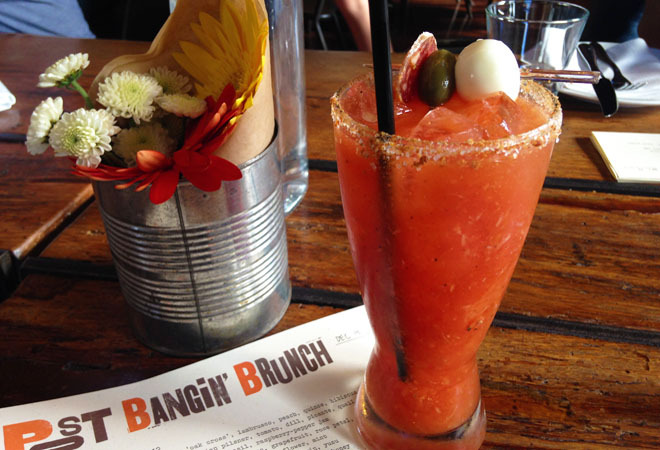 Bottomless Bloody Marys are yours for $18 when purchased with a brunch entree. Fortunately there’s a “Hangovers Special” section on the menu with items like the “All in One Breakfast Pizza” if you can only muster enough strength to point. ✶ The Hudson’s Rehab Brunch has $15 bottomless mimosas and beermosas where you’ll never even see the middle of the glass (I can attest to that), or you can slow things down with $5 Bloody Marys. In terms of sustenance, try the Southern fried chicken benedict with poached eggs, toasted brioche, and three pepper hollandaise sauce. And if you want to stick around, happy hour will run from 4 p.m. to 7 p.m.
✶ At Short Order at The Original Farmers Market, the champagne toasts don’t end at midnight. They’ll be cheersing 2014 with free champagne toasts at noon, 2 p.m., and 4 p.m., too! While you wait for that, there will also be Aviation Gin and Dos Armadillos Tequila cocktails and Short Order’s version of the Bloody Mary called “Yes Chef.” Brunch starts at 11 a.m. with special menu offerings like Tione’s Duck Confit and Waffle, Dante’s Fried Chicken, and Short Order Breakfast Burger. ✶ 38 Degrees Ale House & Grill in Alhambra will soothe your ills with ales thanks to its all-day happy hour ($2 off selected taps and well and signature cocktails). Owner Clay Harding swears by the curative effects of the 9.5 percent dry saison Dupont Avec Les Bons Voeux (With Good Wishes). The brunch menu (available 11:30 a.m. to 3 p.m.) features hearty items like pulled pork benedicts, steak and eggs, and a breakfast sandwich with ground pork and chorizo patty, honey bacon marmalade, scrambled eggs, chipotle aioli, and baby arugula. ✶ Cecconi’s in West Hollywood will be rolling out its Bloody Mary cart for the occasion from 10 a.m. to 3 p.m. When it stops by your table, customize your Bloody Mary ($14) with house-pickled vegetables, Fresno chili peppers, and even ghost pepper salt for a real eye-opener. Power it with your choice of vodka, gin, or tequila. ✶ Nothing like sunshine and the ocean air to make you feel that much better, but pair those with M.B. Post’s brunch (which is typically reserved for Saturday and Sunday) and you’re on the right road to recovery. The restaurant, which opens its doors at 10 a.m., will serve the full brunch menu including house favorites like the Pecan Sticky Bun and Chimchanga with scrambled egg, chorizo, spiced pork, pepper jack, yam, and salsa verde. Or try new menu item, poached egg with tomato and white bean ragout over creamy polenta with bianco sardo. For a pick-me-up there’s the “Coughlin’s Law,” a meaty cocktail of Tito’s vodka, Belgian Pilsner, quail egg, picante salame and pickled asparagus. ✶ If you’re looking for those much needed vitamins, The Churchill’s brunch will feature a special Clover Juice Bloody Mary made with fresh “Seasonal” cold pressed juice (tomato, spinach, garlic, cabbage, cucumber, celery, and lemon), Tito’s Handmade Vodka, and house pickled vegetables for $12. ✶ Mohawk Bend in Echo Park will open its doors to its Recovery Brunch at 9:30 a.m. Sip on $5 Bloody Marys and “Mimosas” (made with beer or cider) and take refuge in their full brunch menu. Hmm, will it be the Huevos Divorciados with fried eggs and chilaquiles or the Elvis French Toast made with bananas, peanut butter syrup and bacon? ✶ For New Year’s Day, all three Hungry Cat locations (Hollywood, Santa Monica, and Santa Barbara) will be open for brunch and dinner, so no pressure. Roll in whenever. The raw bar and cocktails will be available all day. Start things off with something refreshing like the Greyhound Proper cocktail of Plymouth gin and grapefruit juice. Or the “Virgin Cats” like the mandarin ginger soda if you want to go the sobering route.